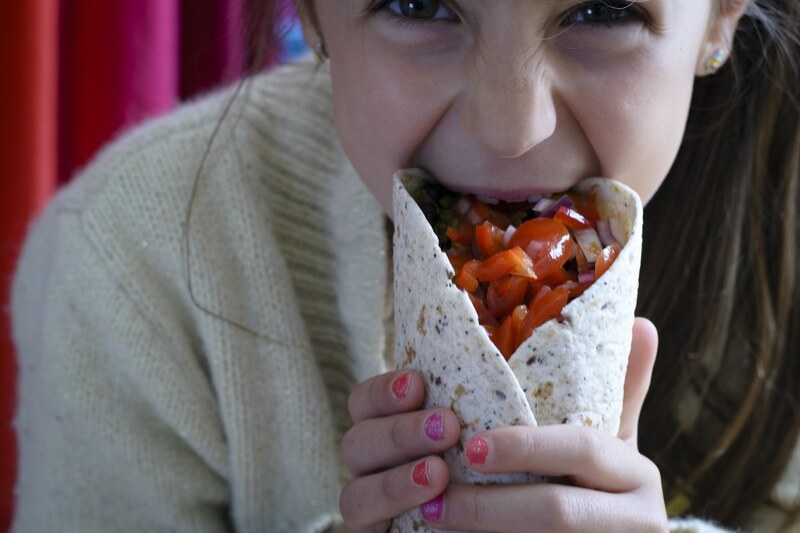 Who says that a Burrito to be good has to be meaty? 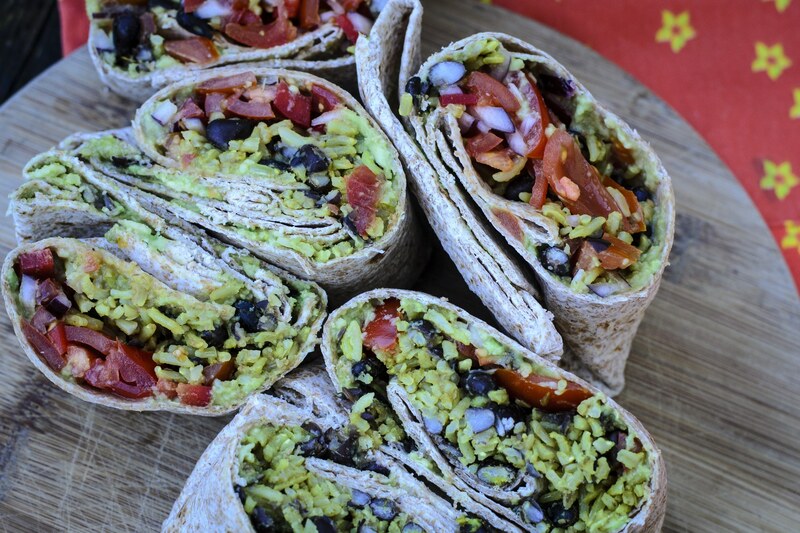 These Vegan Burritos will make you want for more, knowing that they have all the ingredients for a balanced meal: beans and brown rice for your protein, plenty of veggies and with the right amount of carbs! The sun is finally shining after the long winter that we endured here in Ireland. As a friend told me a few days ago, when you experience a sunny day in this country you feel a lot of pressure. The pressure of having to do something outdoor and taking advantage of the good weather. You say to yourself that you better bring today the kids to a park, to the beach, for a ride, for a walk, because you never know what the weather will be like tomorrow! But sometimes you would just like to drag a chair in the sunshine and enjoy a good book, while the kids run and play in the green. Last Saturday was one of those gorgeous day. The night before we had these great vegan burritos for dinner and I had plenty of tortillas and filling leftover because I made, as usual, a big batch. So I asked the kids:” Would you like burritos again today?”. When I heard the cheers of their answer I knew it was a winning recipe! 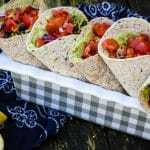 I quickly assembled them, grabbed our picnic blanket, made a phone call to our friends asking them to join us and crossed the road to enjoy the vegan burritos on the green in front of our house. Pour some extra virgin olive oil in a frying pan. Squeeze in the garlic and when the oil is warm add the spices. Stir continuously for a couple of minutes, and then add the rice and the beans. Give it a good stir so that the spices can give a good flavor to the ingredients,. Don't forget to add salt. 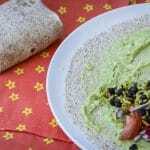 Peel and deseed the avocado and squash the pulp with the fork to obtain a creamy consistency. Slice the onion, the tomatoes and the pepper in very thin and small slices. Add a bit of salt and mix together. 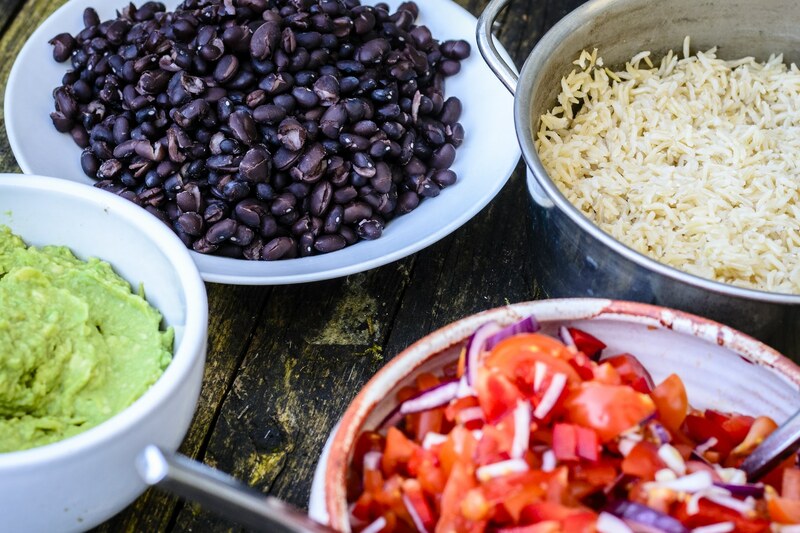 Now it is time to assemble the burritos: take the wrap and spread some of the avocado cream on them. 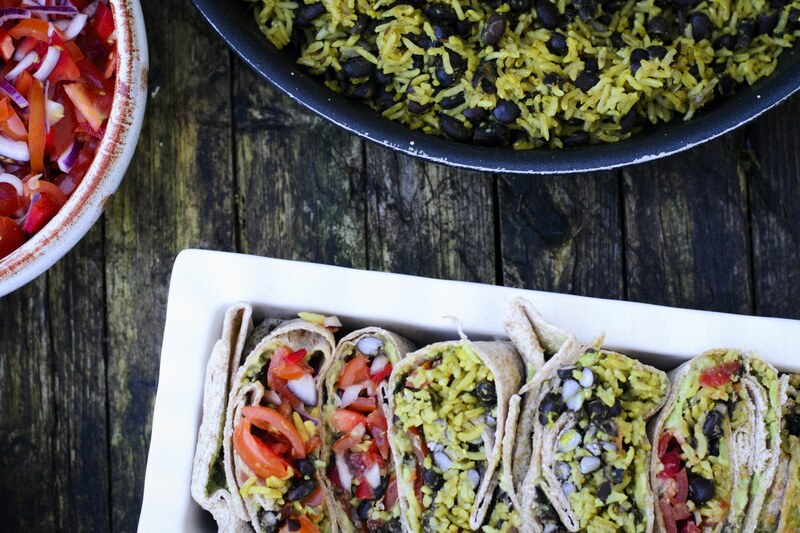 Place 1 or 2 tbsp (depending on the size of the wrap) of rice and beans in the central part - almost at the bottom of your wrap. Pour 1 tbs of vegetables on top of the rice and beans. 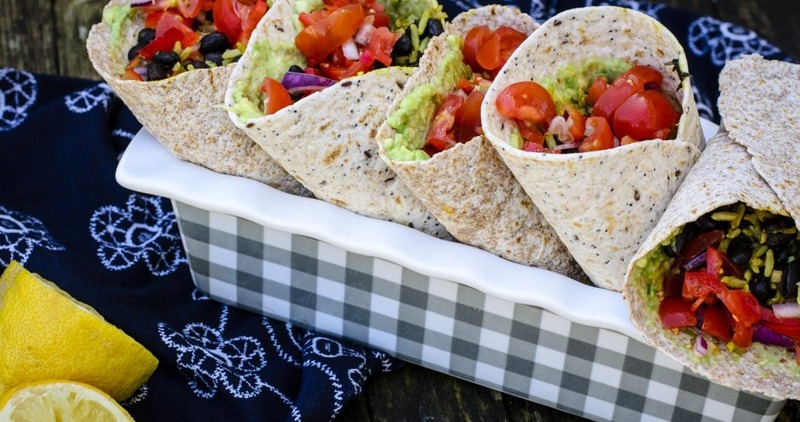 Wrap the tortilla as you prefer around this winning filling!! Sounds amazing. I will try it this week. Thank you Emma for your comment, I am really happy you liked them.